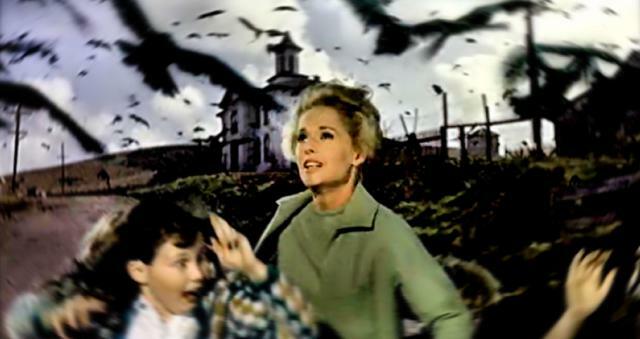 A socialite (Tippi Hedren) pursues a lawyer (Rod Taylor) to his hometown of Bodega Bay, where birds are suddenly beginning to act hostile towards humans. Peary notes that while this loose adaptation of Daphne Du Maurier’s short story “disappointed most everyone when it was released”, it’s now “justifiably regarded as one of Hitchcock’s true gems, an exciting, complex picture that is technically dazzling [and] extremely well written” — not to mention “ideal for viewers who enjoy digging for themes”. Indeed, given that none of the characters in the film “has an explanation for what is happening”, it’s possible to project numerous theories and metaphors onto the story: perhaps, as Peary writes, the film is attempting to portray a version of “Judgment Day”, or “perhaps the birds have just decided to reclaim their world from the intruding human species, who had proved to be cruel landlords”. Peary himself asserts his belief “that the film is much like a Christian parable”, in which “the bird attacks serve to force humans to regain their humanness, to bring them closer together, to love one another” — given that each of the leading characters is shown to struggle with issues of trust and abandonment. He fittingly notes that, “when challenged by an alien force”, they “forget the barriers they had set up between themselves and come through for one another”, forming a “human flock” by the film’s disturbing, apocalyptic end. Thematic concerns aside, The Birds remains one of Hitchcock’s most interesting experiments in horror; its pacing and overall timbre are unlike anything he attempted before or after. As Peary notes, the “film’s highlights are not necessarily the bird attacks” (though they’re terribly disturbing) “but how Hitchcock builds suspense prior to them”; and, unlike in his iconic thriller Psycho (1960), just for instance, no music at all is used to heighten emotions — just expertly sound engineered bird noises. Featuring a debut performance by Tippi Hedren that will “grow on you”, The Birds remains a worthy, unique entry in Hitchcock’s vast oeuvre, and is certainly must-see viewing for film fanatics. Yes, as one of Hitchcock’s most terrifying films. A no-brainer must-see which holds up well on repeat viewings. I’ve seen this one quite a few times over the years. It’s a title that was often shown on tv when I was a kid (with some edits – to tone down the attacks, as I recall). The more times I have seen the film, the more I have come around to thinking that – although the audience and characters experience them – there are no actual birds. The birds as metaphor reveals them as stand-ins for adversity in life in general…which either causes people to be unable to cope or brings them closer together. Adversity of almost any kind is, after all, a kind of attack. wear almost throughout the entire film. In essence, ‘The Birds’ is about Melanie’s search for a mother’s love – “My mother? Don’t waste your time.” is a key line in the script. Still, as a horror story, the film is quite effective as well – as we work out the subliminal psychology for ourselves. I’m especially taken with Suzanne Pleshette’s performance in this film. And Rod Taylor is just insanely dreamy (even if the age difference between him and Veronica Cartwright is a tad too marked for them to be believable as siblings). I also like some of the small comic touches that Hitchcock relieves us with (i.e., the love birds seen in the car’s passenger seat as leaning to the side when the car turns a sharp curve; just delightful). ‘The Birds’ is a perfect example of why I love Peary’s book so much – he takes a film that’s been much analysed but he gives such a fresh, insightful account as if one were seeing a ‘classic’ for the first time. Of course, ‘The Birds’ is such a complex film that no short review can say it all – but if one doesn’t want to watch the film and read more about it, then film really isn’t your medium. The main point I think Peary misses is that ‘The Birds’ can be placed in Hitchcock’s long obsession with mother figures. In contrast to Peary’s generous, optimistic view, the film could be said to end with Melanie reduced to a near-catatonic state and Jessica Tandy’s mother-figure back in the centre of her son’s life.